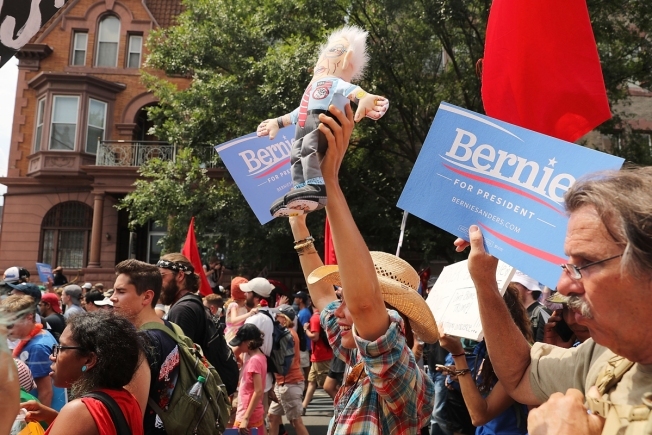 Bernie Sanders supporters are joined by other groups as they march towards FDR Park on the first day of the Democratic National Convention on July 25, 2016, in Philadelphia, Pennsylvania. As the Democratic Party absorbed the shock of Donald Trump's presidential win and, at least, another two years of a Republican-controlled Congress, progressives were calling for a more liberal agenda and eyeing a takeover of the Democratic National Committee. Trump’s win underscored the divide among the so-called establishment and a more populist wing allied with senators Elizabeth Warren of Massachusetts and Vermont Sen. Bernie Sanders, Hillary Clinton’s former rival for the Democratic presidential nomination. The next chair of the DNC will play a key leadership role as the party builds itself back from defeat. According to NBC News, Rep. Keith Ellison, the co-chairman of the Progressive Caucus, is gaining momentum as the left's apparent candidate of choice to lead it, according to NBC News. Sanders announced his support for Keith, of Minnesota, in an Associated Press interview Thursday morning. The party's liberal wing has begun jockeying for power since Clinton's defeat, arguing that her loss could be attributed to her reluctance to fully focus on economic inequality and tougher Wall Street regulations. "More than anything, this election is an indictment of politics as usual," said Richard Trumka, the president of the AFL-CIO, the Democrat-aligned labor federation. Sen. Elizabeth Warren, speaking at the AFL-CIO on Thursday, noted that though Trump won the Presidency under a Republican flag, the party's leaders — Mitch McConnell, Paul Ryan — and the Republicans in Congress were rejected. "Rejected by their own primary voters, rejected during the campaign, and rejected in Tuesday's election," Warren said. Meanwhile, Howard Dean has announced a bid to head up the Democratic Party again, a post he held during the Bush administration. The dems need organization and focus on the young. Need a fifty State strategy and tech rehab. I am in for chairman again. "The dems need organization and focus on the young," Dean tweeted Thursday. "Need a fifty State strategy and tech rehab. I am in for chairman again." Dean mounted an insurgent primary challenge in 2004, running on a more liberal platform than eventual nominee Sen. John Kerry. He served as Democratic National Committee chairman from 2005 to 2009. Interim chairwoman Donna Brazile is supposed to end her position early next year. Without a Democratic president to pick her successor, the committee will hold open elections for the post. Former Michigan Gov. Jennifer Granholm, New Hampshire Democratic Party Chairman Ray Buckley and Rep. Xavier Becerra of California are also rumored to be considering running for the position.